Ansley Designs: STOOPID Cheap Halloween Decor!!!! 6 Money Saving Tips on Halloween!! STOOPID Cheap Halloween Decor!!!! 6 Money Saving Tips on Halloween!! Yes, you read that right! This post is all about great tips for going all out on Halloween without doing the same to your wallet! Decorate smart, but stoopid cheap! Step 1: Inventory First thing's first, you need to see what you have for Halloween already! Figure out where you want to set it up, and put it on display. This way, you know where you need/want more decor and can plan/purchase accordingly! Step 2: Use what you have! I can't stress this enough! If you have it already it's not going to cost you a dime! 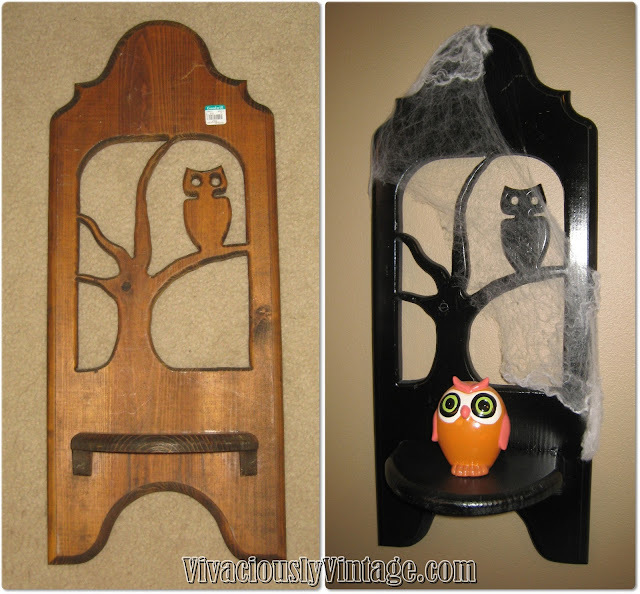 Reinvent items around your home and utilize them for Halloween. And, of course, reuse your Halloween decor from previous years (step 1: Inventory)!This basket was just sitting on top of my kitchen cabinets. Add some spider webs, creepy cloth, and a skull...Now it's a creepy tomb display on my coffee table! This eerie guy is actually a wicker vase! I just placed a skull on top and wrapped the whole thing in creepy cloth! Now he looks sort of like a mummy! A birdcage is now a crawly home for rats! Step 3: Dollar Store! Go to your dollar store FIRST!!! The earlier you go, the better the selection. I go to the Dollar Tree, where everything is only $1! 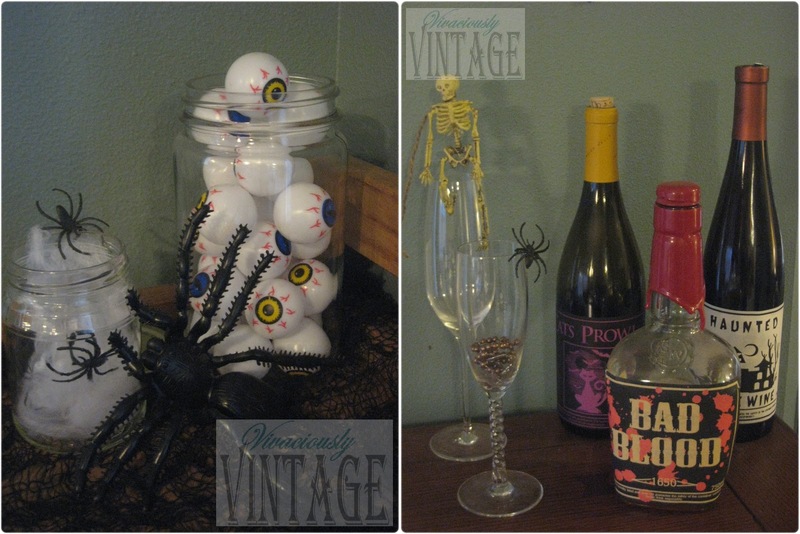 At least get your staple items here: spider webs, creepy cloth, spider rings for the webs, etc. And with just a little imagination the items that might look boring can be fabulous! The skulls and rats in the above photos were all from the Dollar Tree! That awesome wall hanging? It's a floor mat from the $ tree. I cut it a bit smaller and put it in a frame I already had (I painted it yellow and glazed it)! The black and white "beware" sign...$1! That little orange pumpkin was actually from an old flower arrangement that I got, but I've seen them exactly like this at the dollar tree. And there's my creepy vase mummy again! Awesome skull art? These are felt cutouts from the $ tree. I used some thrifted frames and painted the old photo black. Then just tape the felt skulls on top and put them in the frames. Sometimes all you need are a few spider webs! Put them everywhere! Above cabinets, on your bushes outside, over some vintage books...all over! I only used one bag for all of my spidery goodness! Creepy rat silhouette? A pack of 15 was only $1. I have them "running" up my stairs, too! Fill some recycled glass jars (Step 2: use what you have!) with $ store eyeballs, spider web, and spider rings! The wine labels were also from the Dollar Tree. I got them a few years back, and just saved the bottles! Okay I'll have to restrain myself from drowning you in all the goodies I got for only $1! Just go in there and see, it's awesome!! !Step 4: Go thrifting! Check out their selection of Halloween decor. My Goodwill prices things as "holiday" and it's never on special. So, just be aware of their pricing and make sure that you are not paying too much for something! Keep in mind they got ALL of that stuff for FREEEEEEEEE! I think I'm going to open a Goodwill one day!!! Seriously!It doesn't have to be a Halloween item for it to be Halloween decor! Use your imagination. I found this guy for $5. I little more than I'd like to spend, but he was a good size and very unique. Plus owls are so in! All he needed was just a little black spray paint, and of course spider webs! I also got some of my lamps that I use to back light my window silhouettes (more on that in step 5: DIY!) at Goodwill. One was only $1....they don't have to be pretty, just have to work! Step 5: Do It Yourself! You can make the coolest things for B I G impact, and you don't necessarily need special tools or skills! See how to make this colony of bats here! The pack of black card stock only cost me $5, and I still have TONS left for other projects. I already had a full roll of contact paper, so this ghost cost me a big fat ZERO! I think a brand new roll is about $10. See how to make this guy here! Grab some wine bottles and spray them with chalkboard paint. Complete with a creepy message! These poster board witch silhouettes make a H U G E statement, and cost me less than $2 a window to make!!! If you wanted to be super thrifty, you can piece together the leftover card stock from your bat project instead of purchasing black poster board! See the tutorial on these witches here. Mums are really cheap, too! I paid only $3 each for mine!!! For after dark, leave on the lights in the rooms so you can see the silhouettes well! Or, you can place lamps in front of each window with a fun colored bulb. I used orange! Pair of spider candle holders with stripey candles - $4 for a pair of them. These have been very helpful.....We will be using some of the ideas for a CREEPY (not haunted) HOUSE for smaller children for FREE at our library!